FILE - Tanzanian President-elect John Magufuli takes the oath of office during his inauguration ceremony at the Uhuru Stadium in Dar es Salaam, Nov. 5, 2015. Barely a month in office, Tanzania’s new president, John Magufuli, is going full throttle in the fight against waste and corruption. Tanzanians say they like his take-charge approach, though it is not new for him. Magufuli was nicknamed "The Bulldozer” for similar efforts during his 15 years as minister of works. On his first day in office this November, Magufuli made a surprise visit to the Finance Ministry, where he castigated civil servants who were not at their desks. Magufuli has banned foreign travel for most government officials. He cut a bloated delegation for the Commonwealth Heads of Government meeting in Malta from 50 to just four. Tanzanians have gleefully backed his efforts, posting their own cost-saving ideas under the Twitter hashtag #WhatWouldMagufuliDo. President John Magufuli joins a clean-up event outside the State House in Dar es Salaam, Dec. 9, 2015. 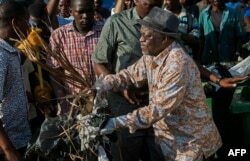 Photos of Magufuli cleaning up garbage in the streets Wednesday were all over social media. He had canceled lavish Independence Day celebrations that day and instead ordered that the funds be used to fight a cholera outbreak that had killed dozens of people and sickened nearly 5,000 more. Evidence of official corruption had been on the rise. In 2014, a scandal broke revealing that government ministers using escrow accounts had allegedly stolen approximately $180 million from the Central Bank. This month, Magufuli suspended the commissioner general of the Tanzania Revenue Authority on suspicion of abetting corruption and tax evasion at the Dar es Salaam port. That official is now under arrest along with five others. Senkai Kilonzo of the Tanzanian NGO Policy Forum, which deals with governance issues, noted that Magufuli was drawing from his past experience. But Kilonzo said real change would take more. Analysts say challenges await, and issues such as low pay within the civil service, which encourages graft, will have to be addressed. Dina Chahali of VOA’s Swahili service contributed to this report from Dar es Salaam.